London-born actor Nonso Anozie is a rising star on the big and the small screen. He’s appeared in blockbusters such as Conan the Barbarian (2011) and Ender’s Game (2013), and in the popular television series Game of Thrones. He talks to SOPHIE LISTER about a new role close to his heart: playing Samson in THE BIBLE series, which after taking America by storm, is arriving on Channel 5 this winter. What prompted you to take on the role of Samson? “For me, as a Christian, playing any character in the Bible is fascinating. But Samson, he’s like the biblical superhero. When I was younger, I used to watch this ‘Samson’ TV show, and I loved the way that he used his strength and powers for good. What would you say is the message of Samson’s story? How has playing the role – and the message of Samson’s story – inspired you in your own life and faith? How does THE BIBLE series go about breaking down prejudices and preconceptions people in our culture might have about engaging with the Bible? “People in our culture have moved away from the Bible. Many may have negative memories of last encountering it during boring school RE lessons, but this series presents the stories in a fresh, dynamic way. Even something as simple as Samson being portrayed by a black guy is an example. This is the Bible for new generation, done in the style of the shows everybody’s watching, like Game of Thrones. What do you think of the recent Hollywood trend for Biblical epics? Noah is coming out next year, and there are Moses and Job films in the works. You’re someone who has been known in part for ‘tough guy’ roles (eg left, as Artus in Conan the Barbarian). The Church in our culture is often accused of failing to engage with men. How will THE BIBLE help? This series will be broadcast on Channel 5 then released on Blu-ray/DVD – what do you hope this will achieve? 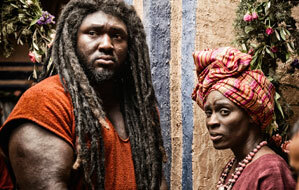 LATEST NEWS: the first episode of THE BIBLE TV mini-series will be broadcast on Channel 5 at 9pm on Saturday 30 November, followed by four further two-hour episodes. You can pick up 24-page souvenir guides (right) from CPO for as little as 80p each in bulk – great for giving away during the Christmas period. These groundbreaking guides are integrated with state-of-the-art Augmented Reality so readers can watch video features and clips from the series on the pages of the book (when viewed through a smartphone or tablet using the Aurasma app available for free download). It can also be used in small group settings for use with the UK DVD launch early next year.